4.2 x 2.7 x 1.9 in. Following in the footsteps of last year's H10 model, the compact, high-zoom Sony H20 adds more resolution, a 720p movie mode, and an array of intelligent capabilities that were lacking in the previous model. Based around a 1/2.3-inch SuperHAD CCD image sensor with 10.1-megapixel resolution coupled to a Carl Zeiss Vario-Tessar branded 10x optical zoom lens, the Sony H20 offers equivalent focal lengths that range from a rather tight 38mm wide angle to a powerful 380mm telephoto. Maximum aperture varies from f/3.5 to f/4.4 across the zoom range, and macro focusing is possible down to a minimum of two centimeters. The Sony H20 forgoes any optical viewfinder in favor of a 3.0-inch LCD display with 230,000 dot resolution. The Sony Cybershot H20 offers ISO sensitivity ranging from 80 to 3,200 equivalent, and includes both true mechanical image stabilization -- a must for a lens with this kind of reach -- as well as Digital Image Stabilization which functions by raising the camera's sensitivity (and along with it, the noise levels) to achieve a higher shutter speed and reduce motion blurring. The Sony H20 also offers face detection capable of differentiating between children and adults, recognizing and prioritizing one specific individual's face whenever they're present in a scene, and detecting when your subject blinks during an exposure. The Sony H20 takes into account the locations of detected faces when calculating autoexposure and autofocus variables. The Sony Cyber-shot H20 also features in-camera retouching capabilities, with soft focus, fish eye effect, cross filter, partial color, retro, radiation, red-eye correction, trimming, unsharp masking and smile effects on offer. There's also ten scene modes plus an Intelligent Scene Recognition mode which automatically chooses between a subset of these modes. All of these intelligent features were absent in the previous H10 model, and should make the Sony H20 a much more approachable camera. 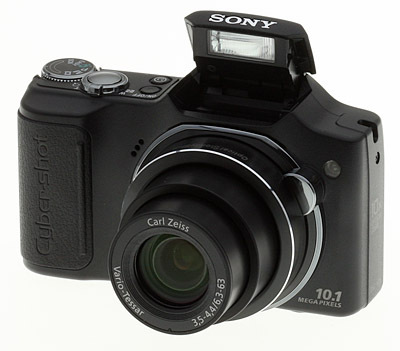 Other features of the Sony DSC-H20 include 720p MPEG-4 high-definition video with mono audio, a Dynamic Range Optimizer function, and both USB / video output connections. The Sony H20's body is only available in black, and pricing is in the region of US$280. The Sony H20 began shipping in April 2009. In a word, "Finally!" Sony has finally shipped a digicam with an HD movie mode. And as someone who has been "encouraging" them to do that for some time now, let me be the one to uncork the champagne for the Sony H20. That isn't the only thing to like about the Sony Cyber-Shot DSC-H20, though. The Sony H20's 10x optical zoom with a 10-megapixel sensor turns out to be a very nice match, delivering 13x19 prints indistinguishable from more expensive gear, frankly. And you'll also be glad to find Sony's face detection technology, selected face memory (which "remembers" a specific face, which it will set focus, exposure and white balance for), anti-blink function (which takes two shots in Soft Snap mode, recording the one with less squinting), red-eye reduction, Smile Shutter technology (which fires the shutter when a smile is detected), and SteadyShot optical image stabilization plus High ISO sensitivity. Not to mention a Bionz processor. But the first thing I liked about the Sony H20 was obvious the minute I opened the box. Look and Feel. And that was my delight at finding a small 10x zoom in that box instead of a bulky mini-dSLR. I've probably been hanging out with too many 20x zooms lately, but I was getting weary of having a mini-dSLR draped over my shoulder every time I went out in public. But the Sony H20 is engaging. It isn't quite shirt-pocketable, but it's flat enough to slip into a coat or bag. If you have enough credit cards in your wallet, you can balance its weight by putting it in the opposite pocket. It does have some heft, which helps stabilize it when you press the very sensitive Shutter button. But the Sony H20 isn't really worthy of a shoulder strap. I just used a wrist strap. The Sony H20's 10x zoom has a removable lens cap. Sony includes a tether, which I tied to the wrist strap. It dangled in the way often enough to annoy me. Which reminded me that most of the time I don't tether a lens cap, I pocket it. The Sony H20's grip is not, as on many digicams, decorative. It's a real quarter-inch protrusion wrapped in textured hard rubber with a thin bar running up and down the inside edge to give you just a little more to hang onto. On the back of the Sony H20, the same material is used for a thumb pad. And that works very well. Controls. The 3.0-inch LCD with 230K pixels on the back is the main control on the Sony H20. Sony tends to rely on its Menu system more than many manufacturers, which keeps costs down by eliminating buttons. The Sony H20's large chrome Shutter button itself and the ringed Zoom control are ideally sculpted. In the corner, a knurled Mode dial offers Movie, Manual, Program, Intelligent Auto, Easy, and Scene modes. On the back panel, you'll find the usual four-way navigator with an OK button in the middle. The Sony H20's arrow keys are dedicated to specific functions as well. The Up arrow toggles Display options on the LCD, the Right arrow cycles through the Flash modes of the popup flash on the top panel (Auto, Forced On, Slow, Off), the Bottom arrow lets you set the self-timer on or off and select a 10 or 2-second option. Above the Sony H20's four-way navigator is the Playback button. You can leave the lens capped, press Playback, and when you're done, just press the Power button to turn the camera off. It's amazing how many cameras do not get this right (switching to Record mode before allowing you to power off the camera). Under the Sony H20's four-way navigator is the Menu button you'll resort to quite often and the Trash button, which you may need much less. Modes. Sony has bucked the trend on the Mode dial keeping things relatively simple without dumbing down operations. It was refreshing to see. On the one hand, the Sony H20 has an Easy mode that makes it safe to hand off the camera to the family member who can never leave things the way they find them. They can only change the image size, self-timer and flash settings. And you also have Scene modes that no one uses, but still do a great job in sticky situations. The Sony H20 includes High Sensitivity, Twilight, Twilight Portrait, Soft Snap, Landscape, Beach, Snow, Fireworks, Advanced Sports Shooting, and Gourmet in its Scene modes. Manual Mode. One of the nicer implementations, relying on just the navigator to set aperture and shutter speed at the bottom of the screen. On the other hand the Sony H20 has a real Manual mode along with Program mode. In Manual mode, you just press the OK button to use the Left and Right arrow keys to set the aperture and the Up and Down arrow keys to set the shutter. Could not be simpler (and is often maddeningly more complicated). Bravo. While the Sony H20 has a nice range of shutter speeds to select from in Manual mode, it has only two apertures. Wide-angle offers f/3.5 or f/8.0 while telephoto offers f/4.4 or f/10.0. That's not uncommon on a digicam. Program Auto is not quite as exciting since it sends you to the Menu system to make any changes. To EV, for example. You can't independently adjust the shutter or aperture. Menu System. 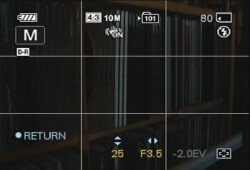 In Record mode, you have to slip into the Menu system to change EV compensation. But Sony doesn't leave it there, either. You get a third hand, so to speak, with the Sony H20's Intelligent Auto that can identify Twilight, Twilight Portrait, Twilight using a tripod, Backlight, Backlight Portrait, Landscape, Macro, or Portrait modes. Being able to tell Macro from Landscape is a real blessing, pioneered by Sony years ago with its disc-based digicams. In fact, the four-way navigator's Macro settings are either Auto Macro or Macro On. There's no Macro Off. On our first foray with the Sony H20, we inadvertently left Macro On in Program mode and were greatly relieved to find out it only gives priority to close-up subjects, so our landscapes were just as sharp as if we had left it set to Auto Macro. On many digicams, the landscapes would have been too soft to print. Movie mode is simple work, too. Select Movie on the Sony H20's Mode dial, press the Shutter button to start recording and press it again to stop recording. Sound is available as is optical zoom (which may be picked up by the mic). And, in another rare but appreciated touch, zoom is controlled. Too many digicams zip in or out, so that any kind of controlled composition impossible. We used a SanDisk Memory Stick Pro Duo to record movies at 720p, for which there are two options. The Sony H20's Fine HD option shoots 1280x720 frames at 9 Mbps while the Standard HD options shoots the same size at 6 Mbps. A VGA option is also available that records at 3 Mbps. On our 512MB card, I could shoot a 6:40 Fine HD movie, 9:50 Standard HD movie, or 19:50 VGA movie. If the Sony H20's Shutter button was unusually sensitive in still recording (I often took a shot when I merely wanted to half-press to focus), it's less responsive in Movie mode. Sometimes I wasn't sure I was actually recording a movie after pressing the button, but apparently I was. The Sony H20's microphone sits right between the grip and the lens barrel, protecting it a bit from the wind, but don't expect great audio quality from any digicam. Lens. The 10x optical zoom lens (with 2x digital zoom) ranges from 38-380mm for stills and 39-390mm for 16:9 movies or 47-470mm for 4:3 movies. Aperture ranges from f/3.5 to f/8.0 at wide-angle and f/4.4 to f/10.0 at telephoto. Sony's SteadyShot optical image stabilization is also included. 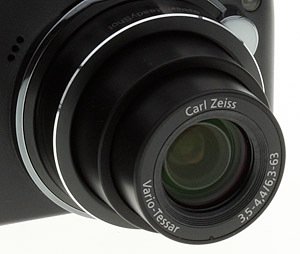 With 10 elements in nine groups (including one aspheric element), the Sony H20's Carl Zeiss Vario-Tessar optic looks like a real camera lens, not a compact lens. And it performs like one, too. The lens pops out pretty quickly (I never felt like I had to wait for it) and zooms in two sections. It retracts rapidly, too, so you won't bump it putting it away. Menu System. The Sony H20's Menu system is a hierarchy of context-sensitive settings. The three main contexts are Recording, Playback, and Setup. 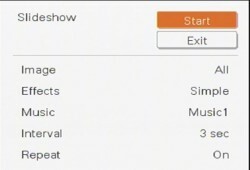 In Record mode, the Menu button takes you to a list of settings that varies with the particular recording mode selected on the Mode dial. In the Sony H20's Easy mode, for example, options are limited to the Image Size and Flash settings. In Program mode, however, options include EV, ISO, White Balance, Focus, Metering Mode, Smile Detection Sensitivity, Face Detection, Flash Level, Red Eye Reduction, DRO (dynamic range optimization), Color Mode, Contrast, Sharpness, and SteadyShot. Memory. Managing the memory card. In Playback, the options depend on whether you're relying on the internal memory or a Memory Stick Duo card. They can include Slideshow, Date List, View Mode, Filter by Faces, Add/Remove Favorites, Retouch, Multi-Purpose Resize, Delete, Protect, DPOF, Print, Rotate, and Select Folder. Finally, the Sony H20's Settings options are organized into five categories: Shooting, Main, Memory Stick Tool, Internal Memory Tool, and Clock Settings. These settings control general camera behavior you won't want to change very frequently. 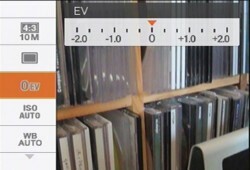 Both the Record and Playback menus include an option to switch to the Settings menu. The Sony H20's Shooting options, for example, include whether to display grid lines or which flavor of digital zoom to use. You can also enable a two-second Auto Review and save the image's orientation information with the image, among others. In another change from its long-standing practice (and one we never failed to gripe about), the Sony H20's menu options now wrap so if you come to the end of the line in Image Sizes, say, pressing the same navigator key once more takes you to the beginning. You don't run into a brick wall. The Sony H20's menu system bothered me much less than previous Sony menu systems. But there are still far too many Recording options buried in the system. One more button on the back panel that we could define to function as EV, for example, or an ISO button with Playback moved to the Mode dial, would have been a great improvement. Storage. 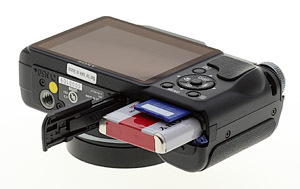 The Sony H20 includes 11MB of internal memory suitable for emergency storage of still images. Just take out the Memory Stick card to use internal memory. 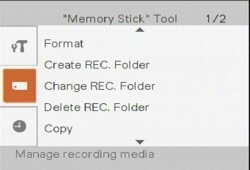 You can later copy images stored in internal memory to Memory Stick card or to your computer. But only the Sony H20 can write images to internal memory. For routine image and movie storage, use a Memory Stick Duo. Up to a 16GB Duo Pro is supported, although the Sony H20 does not support Access Control security. The Sony H20's proprietary NP-BG1 lithium-ion battery packs 3.6 volts. The battery is rated at 290 shots, according to CIPA standards. In my experience, the battery never failed on me and I did not feel obliged to charge it before every outing. I did notice, however, that after inserting the battery, the first power-up was uncharacteristically slow as the Sony H20 calibrates the charge remaining. Sony does sell a $39.99 AC-LS5K Portable AC adapter for the H20. Shooting. There are digicams you love to take with you, digicams you feel obliged to take along and digicams you "Strongly Dislike" packing along. The Sony H20 is in the first group. It was a great companion. That's partly because the images we captured were a pleasure to review afterwards on the computer. That often isn't the case. Things may look fine on the camera's LCD, but when you view them on the big screen, they fall apart. Not with the Sony H20. 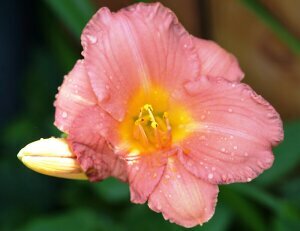 In fact, that 4MB image of pink flowers printed at 13x19 as if it came from a dSLR. There was very little even a close examination could show to say it came from a digicam. When you get results like that, you look forward to taking a few pictures. And having a high resolution 16:9 image size option made it even more fun. This is one thrill that's not generally available on a dSLR for some reason but it's a great match for your HDTV. And you'll find it flatters a lot of subjects, too. 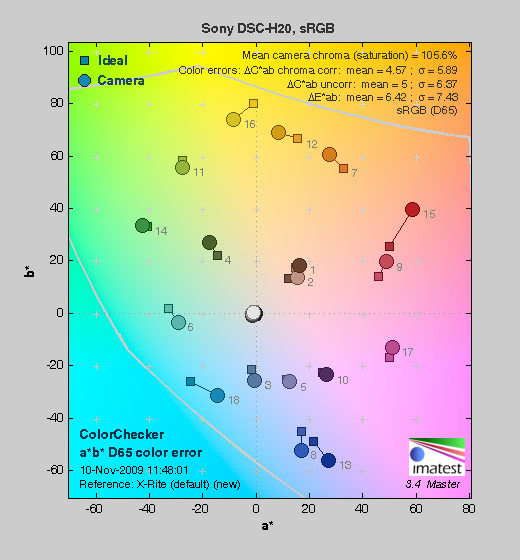 The Sony H20 records a 3,648 x 2,056 pixel image in 16:9, which means you don't sacrifice quality (there's a 2MB 16:9 option if you only want lower resolution). The shot of the Range Rover against Twin Peaks and the copper dome with the Vespa are two good examples of images that really shouldn't be cropped as anything but 16:9. They're portrait orientation, though, which doesn't tax your HDTV. The Sony H20's zoom control was refreshingly smooth and precise, making it easy to compose these shots. A light touch zooms slowly while full travel on the control zooms faster. You can detect some purple fringing. In the Herbie shot, for example, the Toyota's rear window shows some on the left side and the wheels and hood of the car parked behind it show some, too. But it's pretty mild and doesn't detract from the general sharpness and clearness of the image. The Sony H20's noise was remarkably well controlled for a Sony digicam, too. The ISO 1,600 shot of the jars and cans is full-resolution and certainly shows noise in the shadows but the text on the capers jar was unusually clear. The shot was taken in so little natural light you wouldn't have thought to turn the camera on. To get both accurate color and that level of detail is pretty impressive, if not perfect. Sony also does a great job with another touchy subject where digicams are concerned: holding onto highlight detail. The fountain shots (there are three of them) are all high key but even the detail of the cat spout did not blow out the highlights. There's really great detail in the shot, too, down to the drip of water on the cat's chin and what I take to be painter's brush strokes on its snout. Reds were a little too intense for my taste, particularly the geranium, which is not, believe me, irradiated. But that's par for the course on a digicam, too. Slide Show Options. In a word, Fun. You might think we'd be used to it by now, but the octopus cable with USB and AV connectors that plugs into the bottom of the Sony H20 still irks us. For one thing, you have to sit the camera on its face (in this case on the lens cap) to cable connect to your computer. For another, it isn't an HDMI cable so for best results with your HDTV you'll want to buy one. Look for the VMC-MHC2 HD output adapter cable. In-camera slide shows (what you'd do if you connect to your TV) are still among the best of any digicam. Sony offers four styles (Simple, Nostalgic, Active and Stylish) that match music and transitions for a sophisticated presentation. Sharpness: The wide-angle end of the Sony Cyber-shot DSC-H20's zoom is actually fairly sharp from center to corner, with only minimal blurring. At telephoto, blurring is strongest in the lower right corner. We usually see the opposite from long zoom lenses like the DSC-H20's 10x, where the wide-angle end has softer corners. This is an impressive lens. Geometric Distortion: The Sony Cyber-shot DSC-H20's wide-angle lens setting produced slightly lower than average level of barrel distortion (about 0.7%), which is noticeable in a few of its images. At full telephoto, pincushion distortion is about average (about 0.2%), and is also visible in extreme telephoto shots. Chromatic Aberration: Chromatic aberration at wide-angle is moderate, with bright cyan and magenta pixels that are sharply defined. At telephoto, the distortion is again moderate, and again with bright pixels, though softening in the upper corner smudges pixels, making them appear less harsh. Again, while chromatic aberration is present, it's not at all bad for a small 10x zoom. Macro: The Sony Cyber-shot DSC-H20's Macro mode captures a sharp image at the center, with some softness in the corners and noticeable chromatic aberration around the printed details of the dollar bill. Minimum coverage area is 1.19 x 0.90 inches (30 x 23 mm). The camera focuses so closely that the flash is blocked by the long lens at the most extreme closeup, resulting in an uneven exposure. Thus, you'll want to stick with external lighting for your closest macro shots. Color: Color is just about spot-on in terms of saturation and hue accuracy, with only slight hue shifts in cyans and yellows. Strong reds are the only tones that are grossly oversaturated, while some yellows are a bit muted. Many consumers like brighter than life color, so the DSC-H20's strong reds should appeal to that tendency. Dark skintones are a little more saturated with an orange tint, while lighter tones shift more toward a cooler reddish tint. Overall, though good results. ISO: Noise and Detail: Detail is quite good at ISO 80 and 100, with some very slight softening beginning at ISO 200though results are still good. At ISO 400, fine details are smudged, but noise remains in check. Results are much grainier, with more muted color, from ISO 800 up to 3,200. 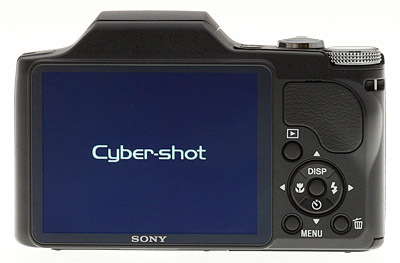 Thus, the Cyber-shot DSC-H20 handles chroma (color) noise by suppressing bright pixels, which in turn adversely affects saturation. For more on how this affects printed images, see the Printed Results section below. Flash: Our manufacturer-specified testing (shown at right) doesn't work well at wide angle when the reported distance goes beyond 16 feet, because that takes the camera out of the main lab, so the wide-angle result is inconclusive here at 23 feet (though the camera boosted ISO to 500). The telephoto test came out bright at 18 feet, but the camera raised ISO to 640. 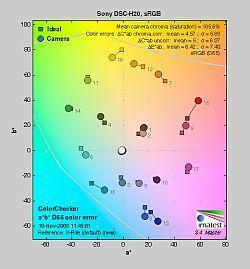 Incandescent: Both the Sony Cyber-shot DSC-H20's Auto and Incandescent white balances produced warm color balances under our standard incandescent lighting. The Manual setting is much more accurate, though it has a very slight greenish cast. Printed: ISO 80 and 100 printed results look good at 13x19 with good color and detail. ISO 200 shots look great at 11x14, and though ISO 400 shots lose a little detail at this size, they're still quite good. Of course, for better quality at under closer scrutiny, ISO 400 shots look better at letter size (8.5x11). ISO 800 shots look very good at 8x10, though with slightly spotty shadows that are nevertheless devoid of chroma noise. ISO 1,600 shots are quite good at 5x7, and ISO 3,200 shots are reasonably good at 4x6. Don't expect a lot of detail, but a closer portrait of someone is going to be quite usable at 3,200, though finer details will be lost. Shutter lag: Full autofocus shutter lag is very good, at 0.32 second at wide angle and 0.31 second at full telephoto. Prefocus shutter lag is 0.012 second, quite blazingly fast. Cycle time: Cycle time is slightly slower, capturing a frame every 2.0 seconds in single-shot mode. Sony claims the H20 can capture up to 100 shots at 1.8 frames-per-second, but we didn't test that mode. Flash Recycle: The Sony Cyber-shot DSC-H20's flash recycles in 11 seconds after a full-power discharge, which is slow. Large capacity Memory Stick Pro Duo memory card. These days, 4 and 8GB cards are inexpensive. I liked the Sony Cyber-shot DSC-H20 the minute I opened the box and saw how compact it was. It isn't small, no, but it isn't a brick either. And since it includes a 10x optical zoom, that's saying something. I wasn't really thrilled about the interface, which sends you to the menu system for common adjustments like EV compensation. But I did appreciate having a Manual mode. In fact, every digicam should have this range of options on the Mode dial (plus the rare Aperture and Shutter priority modes). Image quality was surprisingly good. There was the usual chromatic aberration common in long zooms but the images seemed sharp corner-to-corner and color was good. That wasn't a surprise, but the color and detail at higher ISOs was. The Sony H20 simply captured some excellent images. I can't think of a situation indoors or out that the Sony H20 wouldn't be able to handle. And with its range of options (like Manual mode and HD video), you can even play around a little, too. The 10x zoom beats the daylights out of 3x and 5x zoom digicams if you're traveling, and the image quality is among the best I've seen in a small camera, and the price is tough to beat. That easily earns it a Dave's Pick.